What if your fate had already been decided? What if your destiny was not your own? Joe is a corporate underachiever who is approached by the mysterious Eliza, and told that his soul belongs to the devil because of an ancient treaty between Heaven and Hell. Joe must now perform odd jobs for his boss, with no understanding of their importance in the battle for mankind. When Joe finally sees the consequences of his actions, can he break away, or is redemption out of his reach? 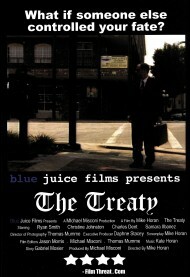 Adapted from the original story by Gabriel Mosier, THE TREATY was filmed by EMMY Award winning Cinematographer Thomas Mumme, shot entirely on location in Gainesville, Florida, with an all Florida crew and gear supplied by Adrenaline Films in Orlando. It stars Ryan Smith and Christine Johnston.